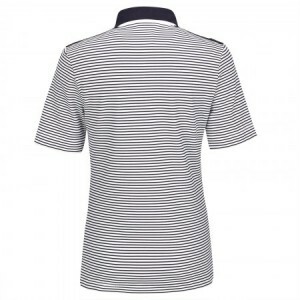 Golfino functional golf polo "Nautical Stripes" with short arms. Maritime golf wear in slim fit from premium Lycra functional material. The golf polo is noticeably soft on the skin, stretchy and breathable. 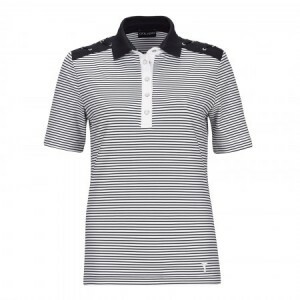 The extremely flexible jersey material offers comfort as a 1st layer of your golfing wardrobe. Due to the special yarn construction, moisture is transported from your skin to the surface of the fabric, where it quickly evaporates and keeps the body pleasantly dry. Play feeling dry and with plenty of room to move thanks to the material especially developed for the requirements of golfers. 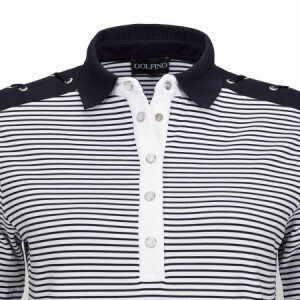 Latest golf wear with striped pattern and extravagant Golfino eyelets on the shoulder.